Loan pricing decisions are only as good as the assumptions that are made when pricing new loans, and one of the most crucial assumptions you make is your target level of ROE. 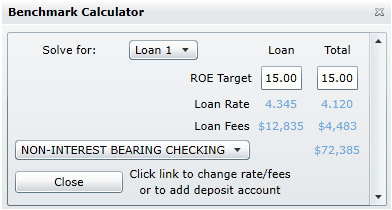 LoanPricingPRO helps you to calculate accurate ROE targets. Most financial institutions, including those that have pricing models, have little basis for objectively determining how to properly set ROE targets. If the target you select is too high, you’ll take lenders “out of the market” by forcing them to overprice loans. If the target you choose is too low, you may see short-term growth in market share, but this will come at the expense of long-term profitability and a lower level of return. At ProBank Austin, our experience with loan pricing and bank-wide profitability systems can help you make better pricing decisions. The LoanPricingPRO team has the knowledge and experience to help you determine your existing product’s ROE and to examine how they compare to your competitors’ offerings. This in-depth understanding allows you to compete more aggressively due to the objective analysis provided from knowing your actual ROE performance.